Red Velvet: Designed as a part of 'Les Deux', our capsule collection inspired by the colorful and flavorful macarons made by San Francisco confectioner, Chantal Guillon. Celebrating fashion's favorite confection, these "Red Velvet" sunglasses were inspired by French macarons of the same flavor. Jelly red lenses and hand-polished red acetate are accented by mother of pearl side inlays. 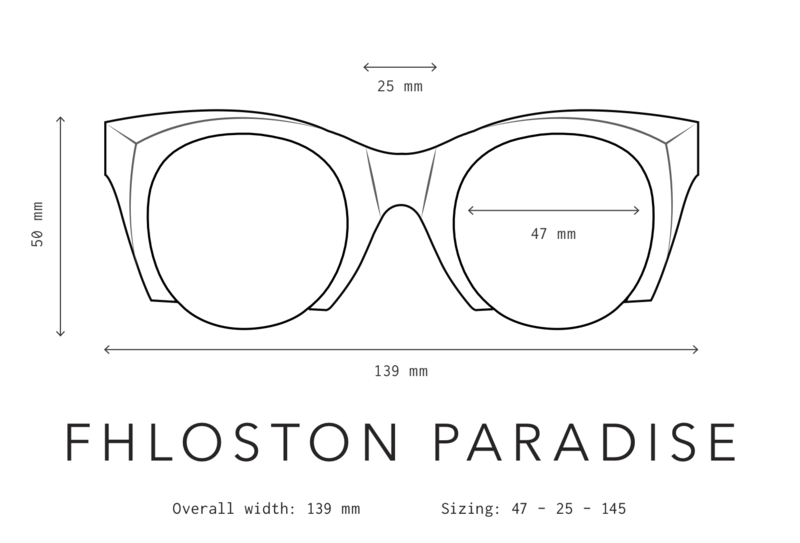 Welcome to paradise: Our fabulous Fhloston is a conceptual take on the cat eye: the rimless bottom gives the illusion of floating lenses, and the faceted corners add depth to the face. Each frame is meticulously handmade in Japan and features high-quality shatterproof lenses with 100% UV protection. The shape was designed to be flattering on all faces. Its super-durable construction and smooth, high-quality hinges ensure these will be your favorite shades for years to come. Designed as a part of 'Les Deux', our limited edition capsule collection inspired by the colorful and flavorful macarons made by San Francisco confectioner, Chantal Guillon. Celebrating fashion's favorite confection, these "Red Velvet" sunglasses were inspired by French macarons of the same flavor.